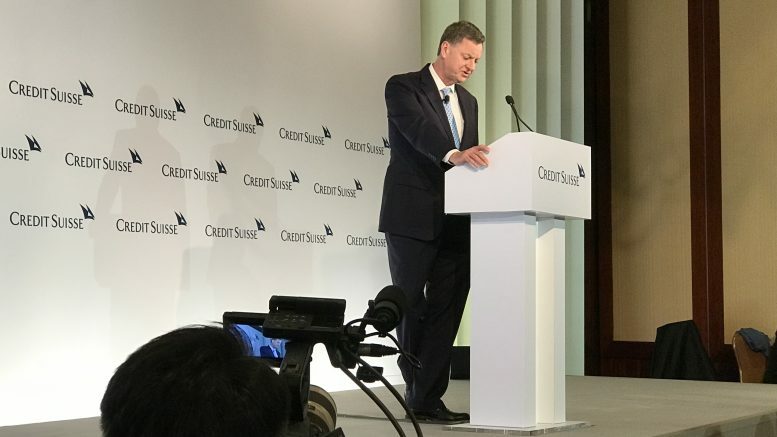 Charles Evans, president of the Federal Reserve Bank of Chicago speaking at the Credit Suisse Asian Investment Conference in Hong Kong on 25 March 2019. This article was originally published on Monday, 25 March 2019 at 21:01 SGT; it has since been updated to provide more details of Charles Evans’ comments. The inversion of the U.S. yield curve may have convinced many market participants that the sky is falling, or at least, a recession is looming, but at least two central bankers — Charles Evans and Janet Yellen — are unimpressed. A yield curve is considered inverted when short-term interest rates are higher than long-term ones. Lending long term is usually considered riskier due to the need to wait longer for loans to be repaid. The inversion is widely considered a recession signal, although sometimes the recession takes a couple years to arrive. On Friday, the U.S. yield curve inverted for the 10-year yield for the first time since 2007, which was around the time the Global Financial Crisis began, after U.S. manufacturing data missed estimates. That worried markets, with the Dow Jones Industral Average and the S&P 500 falling nearly 2 percent each on Friday, although they finished nearly flat on Monday. In Singapore, the jitters sent the Straits Times Index down almost 1 percent on Monday, although it’s recovered a bit in Tuesday’s early trade. But Charles Evans, president of the Federal Reserve Bank of Chicago, said on Monday that structural changes in interest rates indicate the inversion may not be as significant as it once was. He added the inversion of the two-year Treasury note yield over the 10-year Treasury note on Friday was “pretty narrow” at just 14 basis points. He added, this was partly structural, amid a lower trend for economic growth and lower real interest rates. “In that environment, it’s going to be more natural that yield curves are somewhat flatter,” he said. Evans said the U.S. economy was in “relatively good shape,” and pointed to a solid U.S. jobs market, although he added that the 3.7 percent unemployment rate was unsustainably low. Janet Yellen, who headed up the U.S. Federal Reserve from 2014 to 2018, agrees. “I don’t see it as a signal of recession,” she said in a separate session to a standing-room-only crowd at the same conference. “In contrast to times past, there’s a tendency now for the yield curve to be very flat,” she said. She cited two components to the 10-year Treasury note yield: An average of the short-term rates the market expects over the next 10 years, and a term or risk premium. “For much of U.S. history, that risk premium has been positive and significant. But now it’s estimated that term premium in longer term rates is zero or negative,” she said, adding that means the yield curve will be “absolutely flat,” without an upward slope. “That’s not something you’ve seen in the U.S. for most of history. That means its very easy for the yield curve to invert,” especially if market participants are concerned about risks that might lead to a downturn, she said. “It might signal that the Fed would at some point need to cut rates, but it certainly doesn’t signal that this is a set of developments that would necessarily cause a recession,” she said.